Phil Stebbing (blue) scored for Yaxley against Boston Town. Yaxley hit the top of the United Counties Premier Division for the first time this season last night (February 6), and they did it in style. The Cuckoos romped to an 8-0 success over Boston Town at In2itive Park to move two points clear in first place. It’s likely to be a short-lived reign as the four teams beneath them all have at least two games in hand, but inspirational boss Andy Furnell won’t be worrying about that. Former Posh striker Aaron Wiliams in action for Brackley Town. Yaxley struck early through Tom Waumsley and went on to score at regular intervals. Dan Cotton and Liam Hook scored two apiece with Kyle Nolan, Phil Stebbing and Ross Watson also on target. Cotton (34) and Waumsley (32) have scored 66 goals between them for Yaxley. Only Dominic Lawless of Eynesbury has more Premier Division goals. 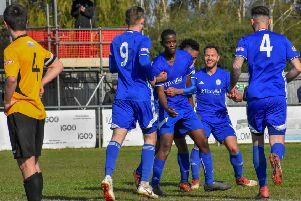 Yaxley should maintain top spot at the weekend (February 10) as they host bottom club Oadby, but next Tuesday (February 13) they have a big game at home to title rivals Wisbech Town. Peterborough Sports just failed to reach the final of the prestigious Northants Senior Cup after losing a marathon penalty shootout to leading National North League side Brackley Town. Lewis Hillard takes a shot for Peterborough Sports against Brackley Town. Photo: James Richardson. Brackley, who play two levels higher than Sports, sent a strong squad to PSL, but didn’t dominate the game until a frantic final quarter of an hour. Sports had done enough over 90 minutes to deserve a draw, but lost out 10-9 in the ensuing penalty lottery when Johnny Butler saw his spotkick saved. Recent Posh striker Aaron Williams played for Brackley. He moved there from Newport County after a successful loan spell. Spalding United’s scheduled Evo Stik Division One South game against Frickley Athletic was postponed.